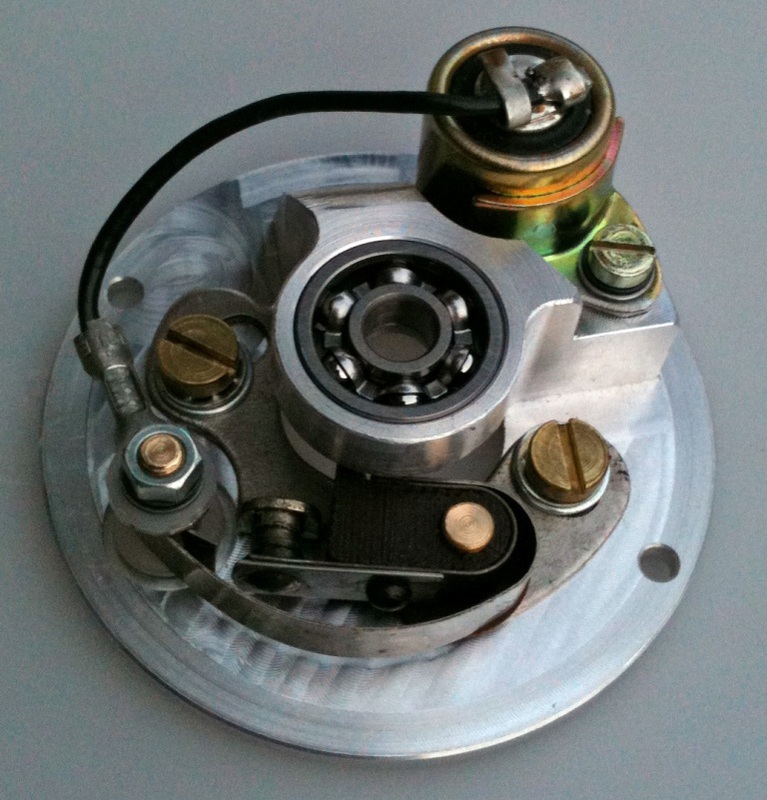 We have new aluminium distributor bodies available fitted with oil seal and bush. Suitable for S7 and S8 Sunbeam. We are pleased to announce we now have in stock brand new genuine SUNBEAM distributor bearing plates (P11/242). This part comes complete with new bearing, points and condenser. Ready to fit. Expertly machined in our Sunbeam workshops from solid aluminium to the highest specification, fully guaranteed. Why not finish your S8 Sunbeam or Classic Bike with our high quality tax disc holder. They are fabricated in the UK from heavy gauge solid brass with high quality threads and feature a waterproof sealing ring. The horseshoe bracket has an 8mm fixing hole and is attached to the holder with three brass rivets - not welded or brazed. The overall diameter is 80mm with a visible window of 65mm in diameter and are available in polished brass, chrome or bright nickel plate finish. The Sunbeam clutch can be heavy and hard to operate, this modification will increase the leverage to the clutch arm making the clutch easier to use. Parts are made from zinc plated steel and the kit is suitable for S7, S7deluxe and S8 Sunbeam. - NOW AVAILABLE - P1/111. - NOW AVAILABLE - STANDARD SIZE P1/073. - Due to many requests, we now have original type chrome horn pushes that screw onto the lever clamp. If you are interested, please order now P9/119. - SUNBEAM Pillion footrests now in stock. Now available (P5/057)(now available from stock). To order any of the items on this page please use the 'Contact Us Now' section of our web site or Please telephone: 0044 (0)1202 768220 (or if placing an online order use the 'special instructions' section to add the item to your order). Thank you. We have tried to describe the items as accurately as possible, but if you require any further information about any of the parts for sale, just give us a quick telephone call or send us an e-mail. Used Front wheel hub to fit Sunbeam S8. These are no longer available new but I have a few good used ones. They are a bit grubby and will need cleaning up and painting. - The order number is P7A/032. NOW IN STOCK is our well known 'modified breather cover' (part number P1/010a) and the 'sump spacer kit' (part number P1/192b). Both of these are well worthwhile mods, just ask any 'Beam owner who has already fitted them. (Stop press - now back in stock..!). We have another small batch of brand new complete plunger choke assemblies for the original AMAL 276 carburettor (P11/060). As you can see from the photograph these are an exceptional 'find' and will fit straight on, instantly replacing the worn out assembly so often seen on so many Sunbeams - a definite improvement for cold starting! Make sure you don't miss out on this one, as stocks maybe very limited. Remember on any of these rarer items they are sold on a strictly 'first come, first served' basis. So, when they're gone they're gone, that's it - no guarantee of finding any more in this sort of condition. Classic Oil Supply in Virginia have Morris Golden Film 30, 40 & 50 in stock (formerly Morris Elite) along with Golden Film AG 140 Gear Oil for the Sunbeam rear drives. 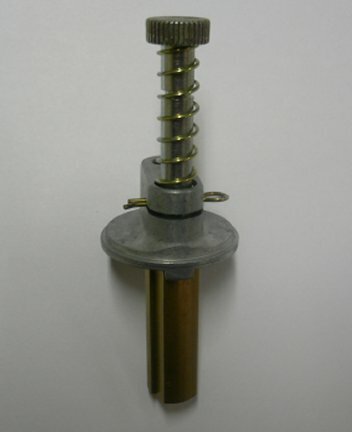 Fitting the centre-stand spring can be difficult and dangerous. 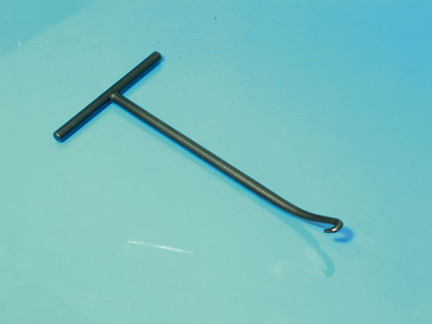 We now have a spring hook tool to make the job safe and easy.